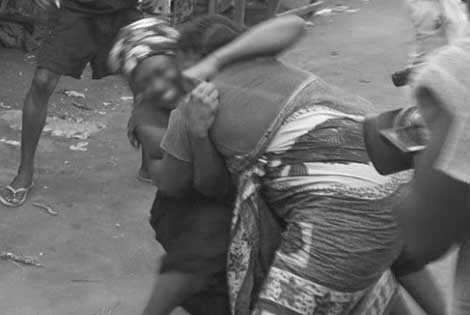 A 22-year-old unemployed woman in Ikeja, Lagso bites off her friend's left ear in a fight over her refusal to pay money borrowed from her. Tope Olanrewaju (22), who allegedly assaulted her friend by biting off her left ear, was on Friday granted 100,000 Naira bail by an Ikeja Magistrates’ Court. The Chief Magistrate, Mrs B.O. Osunsanmi also granted the accused one surety in like sum, who must be gainfully employed. Tope, who is unemployed, had borrowed some money from Tolulope Adekoya, whose ear she allegedly bit. According to Police Prosecutor, Simeon Imhonwa, the accused committed the offences on May 7 at about 4PM at Toyin Street, Ikeja. Imhonwa alleged that the Tope beat Tolulope to a pulp and cut off her left ear with her teeth. Tope pleaded not guilty to the two-count charge of assault occasioning grievous harm and unlawfully inflicting wounds brought against her. The Magistrate has fixed June 1 to continue the hearing.